It has a commanding position, this castle. The valley is a long way down, past the defensive walls and earthen ramparts that would have kept invaders at bay. But though it was not ravaged by attack or starved by siege, still Berry Pomeroy Castle fell into decline, a victim of the folly of human ambition. It passed from the Pomeroy family (after which the nearby village of Berry Pomeroy is named) and was acquired by the Seymours. But Edward Seymour's grand vision for the North Range was never realised. In the end the money simply ran out. Perhaps the lofty position of this place became an adverse influence. In retrospect, Edward Seymour must have wished he had kept his feet firmer on the ground. As the years passed, the lead was stripped and the timber plundered and the place became a ghost of its former glories, the ideal site for local legends of haunted happenings concerning a lovelorn maiden, incarcerated in a tower by her jealous sister. The remnants still stand today (roofless except for a small section above the gatehouse) for Sherry and I to take our separate turns in and around (unfortunately the privilege does not extend to canines.) And when my time finally comes, after sitting with the Lady on the grass banks, I find it hard to immerse myself in this world of the past. In spite of the faded, reconstructed diagrams of the castle that would have transformed it into a palace if Seymour's plans had been fulfilled, I can only gain access as far as examining the walls and seeing the usual culprits: ivy-leaved toadflax and pellitory-of-the-wall, and the jackdaws cawing and hopping and playing hide-and-seek with each other and with me. We passed the former medieval fishponds (the larder for many a banquet centuries before us.) 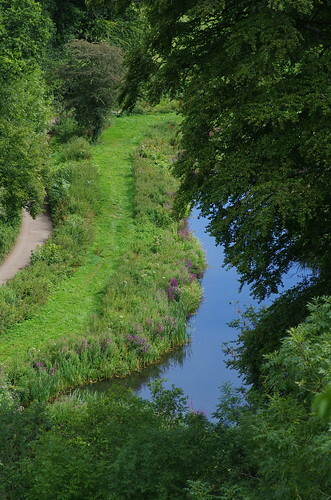 Today the lake and its verge are a haven for wildlife and especially wild flowers. We're well into August but there's still a fairly wide selection of wild flowers to record and identify. 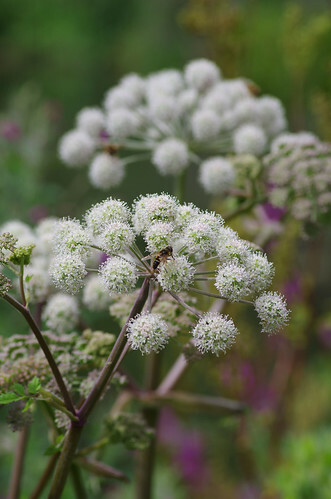 This Wild Angelica proved extremely popular with bees and hover flies alike. Sherry could have taken the same picture a thousand times and have a fuzzy buzz feature somewhere in the frame. 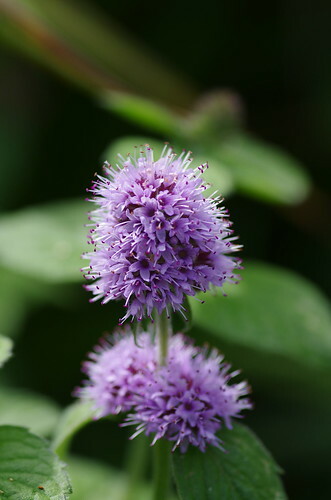 There were plenty of examples of Water Mint (Mentha aquatica) for Sherry to capture, too. One flower proved a big hit with this Comma Butterfly which obligingly posed upright, upside down, to either side and every conceivable angle in between. Eventually we left the gorgeous light of the pond and proceeded in no particular hurry along the lane, examining its hedged borders for interesting bugs and "mini-beasts." 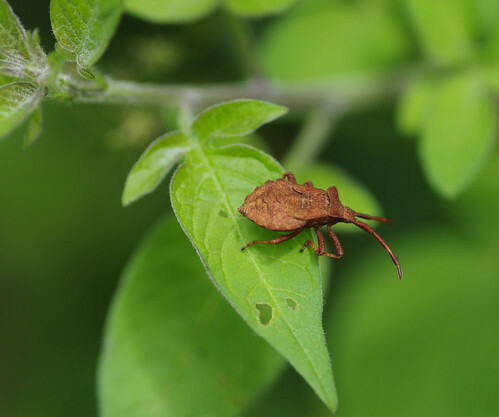 I cannot recall seeing one of these bugs before. Shooting down and into the undergrowth, Sherry had to persevere to make sure it came out clearly enough, and in the end was forced to increase the shooting distance. Further down the lane, the light was better and more conducive to producing better pictures. 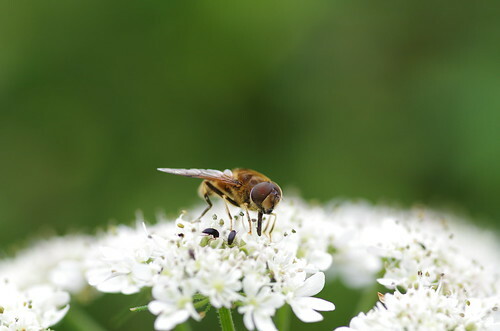 In bright sunlight, these hogweed flowers came out a bit too harshly lit, detracting from the insect. But when the sun went in a shade, the right balance was soon achieved. 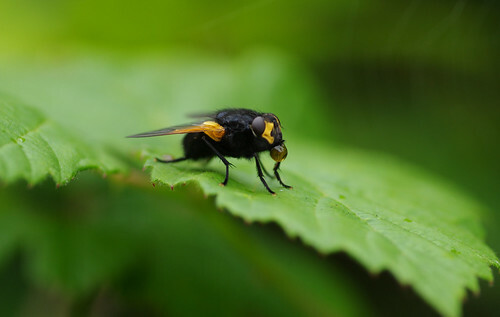 The fly above caused quite a headache to reproduce correctly. Sherry must have taken upwards of thirty images before moving on. The fly stayed reasonably still throughout and we watched in awe as it repeatedly appeared to be blowing bubbles and then retracting them. Perhaps these were drops of water or honeydew. You might just be able to detect a hint of a reflection in the drop, while in the top right of the image the faint lines were actually a cobweb in the background. I liked the texture of light and shadow on this fungi we saw to the side of the woodland path. 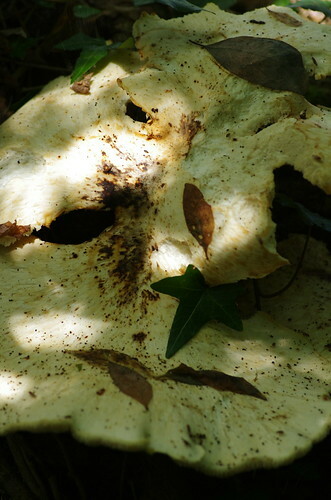 One thing I have noticed about some internet forums is how pristeen the fungi often look. Either these people are very lucky or they have excessively indulged in the practice of gardening - clearing all surrounding vegetation to get the possible shot. The fungi we encounter in the wild has often been nibbled beyond recognition or pulled up out of the ground and left out for display. Or then there are the fungi like the specimen above. Perhaps, by removing leaves and grasses, a photographer can not only alter the natural balance of things but also sometimes potentially miss an interesting or unusual shot. On the return journey, we paused to admire the tremendous resilience of this battered creature. Let's face it, if something many times our size, pecked and tore chunks out of our bodies, would we just carry on as if nothing had happened? 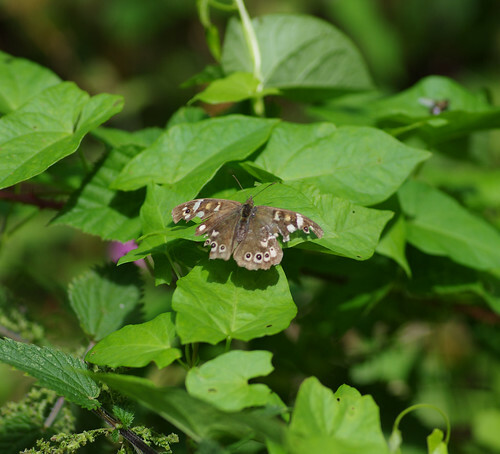 This Speckled Wood was like a hardened prize-fighter in my book. It's clearly taken its fair share of knocks - the ringed spots on the outer edges of the wings can fool potential predators into seeing false eyes, the most vulnerable spot. 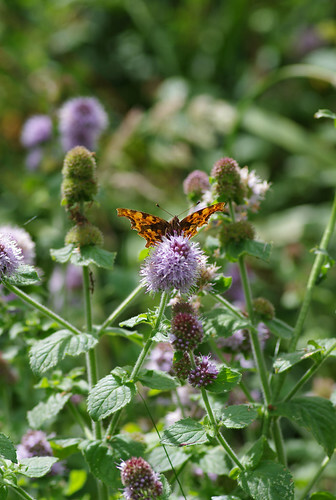 And, of course, sometimes the butterfly could conceivably get caught in the undergrowth. Which begs the question: if a cat has nine lives, how many lives does a butterfly have in its brief time on the wing? 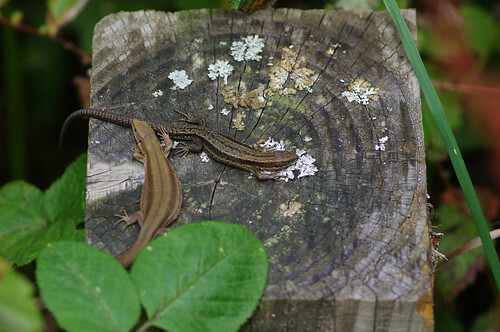 MORE LIZARDS!! A pair this time. 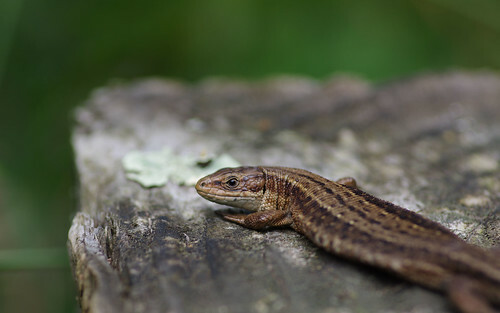 I thought at first the female could be heavily pregnant until I realised that all the lizards we saw basking did exactly the same thing - splaying themselves in such a way to expand their bodily surface area and thus absorb more heat. 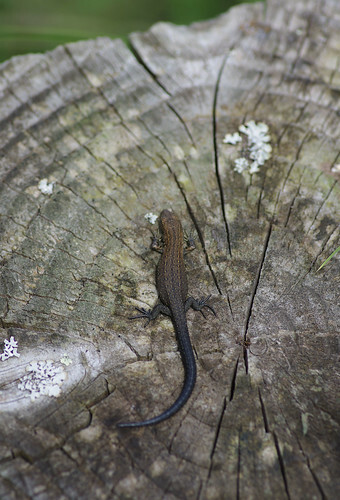 We saw many more sunbathing and were spellbound by the many varieties of colour forms. In fact, at this point we were riding the crest of a wave. Perhaps I should have seen it coming. Sherry had earlier diverted off the path, and in returning to it, told me about a wasp's nest in the ground and the wasps that were pouring from it. Sensibly, she bid her retreat and kept to the main path. Later, as I looked out towards the pond and the grass verge outside it, I noticed the couple peering into the ground and thought that I would never be that brave or stupid and had consequently not been stung for many years - precisely the sort of smug assessment that generally leads to being knocked down a peg or two. A few minutes later, the couple caught up with us and after briefly chatting about the silver-washed fritillaries they had seen, they wandered on. Surely it could not have been a coincidence that I was stung almost immediately after? I panicked and struck at my arm with the book in my other hand. And as the piercing pain left its scar, I looked at my wrist like a man who had lost his favourite watch and instinctively can't stop checking the time. And maybe there was also something of the aggrieved boy who looks at the pain so intently, as if the act of looking might dissolve the sting in an instant. But when the sting did not go away and also began to throb, I came up with an outlandish theory that the wasp had somehow hitched a ride on the passers by, had sought vengeance on the uninvited guests and that it was all a case of mistaken identities. Suffice to say, the walk ended on a sour (and sore) note soon after.